It's been a while since my last TPD ride along, probably a few years. So Saturday night, I took another one. Since I had been on a ride along before, I was familiar with the dos and don’ts. Basically it’s stay in the car, and do what you’re told by the officer. From inside the car I can listen to the officer talk through the dash cam mike. Our first call was to Wal-Mart. Two juveniles were eating food from the deli department and throwing away the trash in the aisles. Their parents were called and Wal-Mart didn’t want to press charges. The officer waited for the parents pick them up and we were clear. A little bit later a call came over the radio about two small kids found on 34. A car had been stolen from the Forney Chilis restaurant with 2 kids inside. The officers responsible for that area were already responding so we continued on patrol. This story was on the news Saturday night and Sunday. Our next stop was a traffic violation. 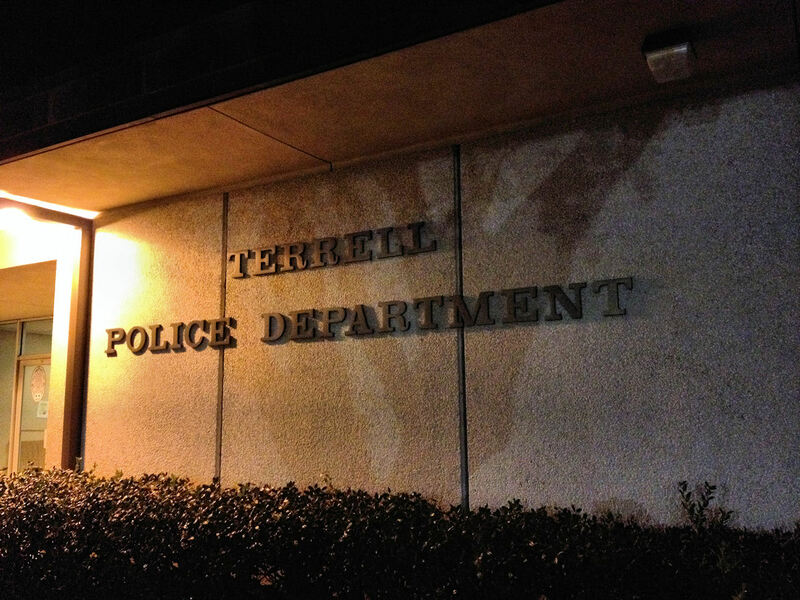 Turns out the driver had outstanding warrants from Terrell. He was arrested and transported to the city jail. We made a swing through Terrell Crossing and Racetrac, checking behind the store to make sure nobody was lingering around. All quiet so far. A good Saturday night. The next hour or so was spent on traffic stops and security checks. We patrolled the streets; checking alleyways, vacant houses and empty lots. There were kids hanging out in a city park on the north side after hours. They said they didn’t know they were in a park. We cleared that and went back to patrolling. As we made our way up to Moore Ave, a call came in about a loud party. It wasn’t in our area, but we responded as a second unit. Most of the crowd was leaving by the time we got there. It was a huge party, with about 100 people in one house. The person that called the police, said the party just got out of hand and wanted everyone to go home. Everyone was peaceful and left pretty quick, so not much of an issue there. We left that location and got a call of an alarm at Brookshires. Checked it out and it was secure. It was after midnight and Ben Gill Park was closed so we drove through there. The officer notice a light flash on and off in the parking lot by the pavilion. We drove over to that lot and found a parked car. The car had three people in it who they said they didn’t know the park was closed. I was still in the car, but could hear the conversations from the dash cam. I was able to listen to all of the stops tonight except the Wal-Mart call. As we were driving out of the park, the officer noticed a truck had pulled in. By now, it’s well past park closing time. Two juveniles were in the truck, and they also claimed they didn’t know the park was closed. The parents were called and we waited until they came to pick them up. It was now 1AM and time for me to finish the ride along. The officer had paperwork to complete, and I've already seen the inside of the ‘big as a breadbox’ station. As we were riding back to the station, I thought about how it wasn’t an easy or slow night, it was a productive night. Even on the easy or slow nights, people are depending on the police to protect them, their family and property. All in all, I would say Saturday night was a pretty successful night.